I've been to many workshops and conferences, and I must say some were pretty ho hum when it came to content. It is so disappointing when this happens -- and let's not even mention when the speaker turns up late or is disorganised. So how can you get your money's -- and time -- worth when this happens? Think about it. You're probably in a room full of people that are similar to you, or you can do business with, or you can build connections with. Yes, it's a networking opportunity. This has happened to me countless times, and often I leave with new clients and new friends! Sure the breaks are great to check emails but they are perfect opportunity to chat with other attendees. Rather than sit in the same seat, if possible, move around so you can meet other people. The best way to start a conversation while networking is simply saying, "Hello, I'm [name]. What's your business (or what do you do)?" Don't forget if you see someone on their own, think of it as the perfect opportunity to say "hi," ask them how they are and introduce yourself. It can be as easy as that. A big event like a conference can be overwhelming, but an easy way to meet new people is to chat about the program or a speaker you like. A good way to get this conversation started is to ask, "My head is overloaded with great information from today; what gem has resonated with you?" If you've connected with interesting people, contact them to have coffee or a catch up after the event. 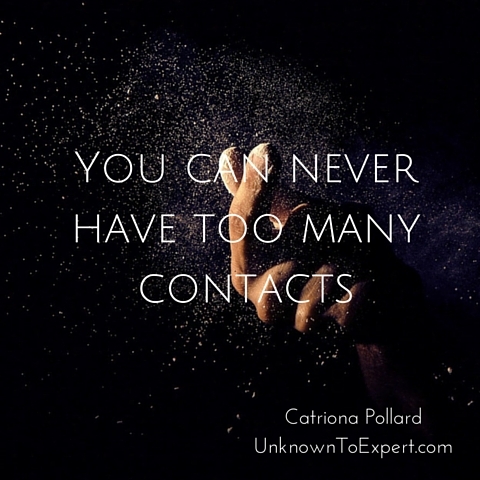 Also, you should just stay in contact by connecting with everyone you've met on LinkedIn. Not all it lost when you turn up to an event that isn't great, use it to your advantage and you never know what opportunities could come your way.